Afri joined with St. Columb’s Park House in Derry for the launch of their ‘Campaigning Communities’ initiative on December 3rd 2015. This project aims to support communities who are campaigning around a broad range of justice and peace issues. As part of the launch, Donal O’Kelly performed his award winning play Fionnuala about the community resisting Shell in Erris, Co. Mayo, who are an inspiration to many communities throughout Ireland. Director of St. Columb’s Park House, Helen Henderson, opened the proceedings with a profoundly insightful reflection entitled ‘Spaceship Earth’, which was followed by an introduction to the ‘Campaigning Communities’ initiative by its co-ordinator Nuala Crilly. Joe Murray also spoke, referring to some of the significant campaigns in which Afri have been involved – such as the Dunnes Stores Strike, East Timor Ireland Solidarity Campaign and supporting the community resistance in Erris. The evening concluded with a rousing medley of protest songs performed by Paddy Nash and Diane Greer. 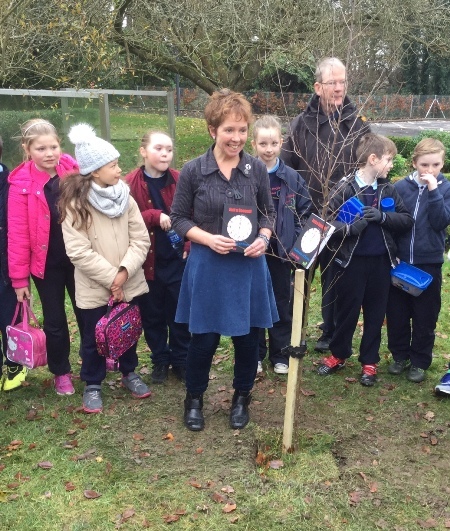 The following day, Afri’s former Development Education Co-ordinator, Rose Kelly, travelled from Moville to St. Columb’s Park House with around 30 pupils from Rang a 4 to launch her book Pathways of Peace and to plant a tree, donated by the Woodland Trust, in honour of the occasion. These were an exceptionally talented group of students who had written and performed their own song as well as sharing their own reflections and poetry on care for the planet. They even drew inspiration from the haka – made famous by the New Zealand rugby team – to convey a message of hope and peace! Pathways of Peace is an excellent development education resource, comprising stories of the lives of inspirational young people and the example of peace and justice that they have embodied. The resource includes their stories as well as suggested activities for use in the classroom. This resource is now available to buy from Afri.